Prevention of healthcare-associated infections (HAI) is of considerable importance given the morbidity, mortality and economic costs associated with complications that are potentially avoidable. In South Africa there is a dearth of HAI prevalence data with no national statistics and hence no appreciation of the extent of the problem. Despite this, local initiatives to reduce HAI have been launched and the Best Care Always (BCA) initiative (private-public collaboration), has resulted in significant progress in improving the quality of healthcare and reducing HAI rates. However, to understand and mitigate the risks of HAI hospitals need an effective surveillance system. In the adoption of any preventative measure for HAI it is essential to know what the baseline situation is. What are the surgical site infection (SSI) rates for this unit, ward, and hospital? What are the rates by type of surgery- colorectal, hysterectomy, vascular etc? Which patients are at risk of acquiring a catheter-associated urinary tract infection and thus may benefit from prophylaxis post-catheter insertion? If these questions (and others) cannot be answered with any certainty then the impact of the preventative measures will never be known. Moreover the answers to these questions will vary by institution, by unit/ward, by patient-population/ case-mix etc. Thus surveillance needs to be hospital-specific and more importantly ward/unit specific. The Wits Donald Gordon Medical Centre has a relatively sophisticated and robust surveillance system for tracking HAI rates by unit and/or ward. This system allows for constant monitoring and trend analysis with establishment of a baseline rate, and subsequent introduction of targeted interventions. The efficacy of the intervention is then monitored using the surveillance system. The example of ventilator-associated pneumonia (VAP) below illustrates this process. 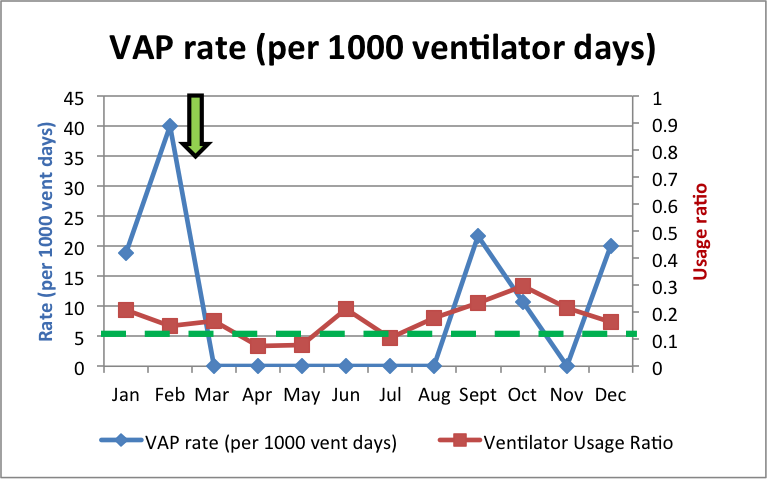 The red line is an indicator of how many patients in the unit are ventilated and the blue line is the rate of VAP. The dotted green line is the baseline rate based on the previous years’ surveillance data. The green arrow indicates the time at which an intervention was introduced. The subsequent decrease in the baseline rate indicates a successful intervention. Ongoing monitoring allows for detection of potential problems with the intervention such as compliance issues (e.g. increase in September) or highlights the need for further investigation. The hospital environment is very dynamic thus it is essential that surveillance is a continuous process. It is important to realize that HAI are part and parcel of healthcare and although certain measures can be taken to reduce that risk there is an “irreducible minimum”, beyond which certain infections cannot be prevented. Of utmost importance is a proactive approach towards achieving that “irreducible minimum”, a target that can only be achieved by understanding what and where the risks are. This understanding is derived from accurate surveillance data.